It was bound to happen one day. I knew it was coming, I just didn’t realize when. 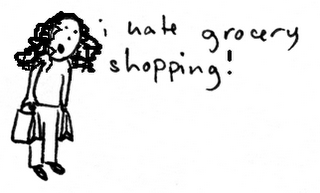 It all happened when I touched the shopping cart handle. I usually have my Purell hand sanitizer with me at all times, but the other day I failed stock up on more—I ran out. Amy came along with me on this shopping venture, because I get tunnel vision when I walk through a huge grocery store. In case I passed out, Amy would run out of there and leave me for dead. Anyway, while we were walking down the aisle, we saw a little kid sitting in the seat of the shopping cart as his mother pushed him around. He was leaning over his seat licking the handle. Great. My grip on my own handle gets less and less at this point. I’d look like a total freak if I were to use my tissues that I had handy in my purse. I remained strong and went on with my shopping trying to ignore the fact that some kid may have been slobbering on my own shopping cart handle driving my OCD insane. We headed over to the deli section. I wanted to pick up some goodies for the evening since we were having dinner at my house that night. 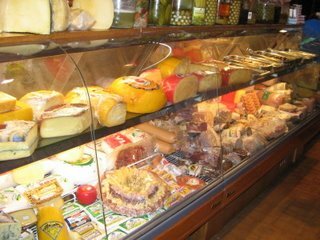 When I looked up to see the clerk slicing the deli meats, I noticed she was handling the cold cuts with her bare hands—no plastic gloves. Deb leaves. Deb drags Amy along with her. End of story. Maybe a few steaks thrown on the barbeque would work. I headed down the meat section to pick up a few porterhouses. Behind the slew of meats sitting in the refrigerated glass counters, you can see the butcher up above in the window working. This is convenient when you want something cut a certain way or if you want to ask him about a certain meat that’s not available. I saw him catch my eye. 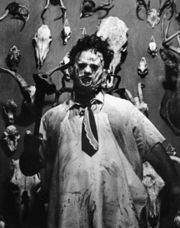 I couldn’t stop staring at him, because he looked like Leatherface from the Texas Chainsaw Massacre. His white lab coat was full of blood and pieces of meat were dangling off him. He had a grim look to him—so I just didn’t bother with purchasing any of his fine foods. I know he’s cutting up meat all day, but change your coat once in a while since you’re right in the window being watched by customers. Who doesn’t like hot wings? I picked up some frozen Tyson wings and picked out organic vegetables and lettuce for a fresh garden salad. My options were getting smaller and smaller. I figured some chicken, potatoes and a nice salad along with some good wine should do the trick. It was settled. We’re on the grocery line checking out. There were two people ahead of us with hardly anything. This is great—this means we’ll be out of there in no time. The checkout girl was apparently new. Her boss kept helping her with each item she tried to slide through the price check machine. It looked like it wasn’t working…until her manager slid it through and it blipped up a price right away. The boss leaves. The girl does another slide across the table with another item. Nothing. She slides it again. Nothing. Deb feels panic rise up within her. The girl tries to wave down her boss. Obviously, her boss wasn’t looking in her general direction. “You might want to call him over hon.” The lady said, as she waited patiently for her items to be rung up. “Paul!...Paul!” The girl screams out. Paul comes over, and the entire line that now has approximately fifteen people waiting starts clapping as if they had just seen a Broadway show. They stood around the cash register trying to figure something out—God knows what. The older lady who was getting rung up was beginning to get more and more frustrated. Her long red acrylic nails were tapping on the counter impatiently. Her wedding ring looked like a chandelier—obviously someone out there in the world is broke…and it wasn’t her. The cashier rings her up and has her out of there. As we’re walking out to the car, the older lady approaches us to tell us how she got ripped off $2.00. She wasn’t a happy camper and the car that she was driving did not reflect what was sitting on that ring finger of hers. She was driving the smallest little economy car ever! I don’t know how she sat in that little thing comfortably—being that she was a larger dame.